Right before the start of their freshman year, the mother-daughter book club faces yet another challenge when Emma’s family unexpectedly moves to England. Leave it to the resourceful girls, however, to find a way to continue meeting and discuss a particularly fitting choice, Jane Austen’s Pride and Prejudice. In England, Emma encounters a new queen bee, Annabelle, who sets out to make her life miserable. Back in Massachusetts, meanwhile, Annabelle’s cousins swap homes with Emma’s family and are causing some major distractions. Cassidy clashes with moody Tristan, a modern day Mr. Darcy, while her friends swoon over Tristan’s younger brother Simon. As the year progresses, the girls each discover new talents, and when they cook up a plan to bring Emma home for a visit by holding a bake sale, it grows into a thriving business, Pies & Prejudice. After their sweet scheme looks like it’s going to fall short, though, they’re left wondering if the club will ever all be together again (courtesy of Heather's website). I enjoy the Mother Daughter Book Club series more with each book. I'm sad that there's only going to be one more. 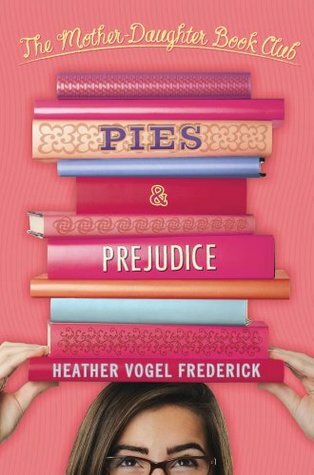 Pies & Prejudice is an excellent continuation of the series. Emma, Megan, Cassidy, and Jess are now in 9th grade. This year, the book club is reading Pride & Prejudice. Quite appropriate since Emma's family moves to England for the year. Like all the MDBC books, Pies & Prejudice loosely follows the plot of the book club's yearly read, Pride & Prejudice. Actually, I thought it followed the plot more closely than the other books. They don't talk a whole lot about Pride & Prejudice as a book, but you get a good introduction to the story through a modern retelling. Cassidy and Emma's stories most closely resembled P&P - the modern Mr. Darcy, Mr. Collins, Mr. Bingley, and Caroline Bingley affect their lives most. Of all the characters, Cassidy most resembles Elizabeth - she's just so stubborn. But you also see Lizzie's wit in Emma and Megan. Cassidy comes into her own in this book. She's always been my least favorite character, but you really see her good heart shine here. One thing I noticed is that the parents don't play as large a role anymore. They're still central to the book, but you don't see one parent doing something silly that becomes a major plotline. The moms and dads are now more background players, supporting their almost grown-up daughters. I love how Frederick manages to make the lives of 15 year old girls relatable to middle-grade readers. Even though the girls are getting their learner's permits, their lives are still appropriate and interesting for 11 or 12 year old readers. I also like how this book is about normal girls with normal lives. There aren't that many books like this out there. Pies & Prejudice is a fun read. There's nothing really deep about it and some of the plot lines are a tad too good to be true, but you get to know and love each character as well as the book the story is based on. I LOVE the Mother Daughter Book Club! Just got this one in at my library and took it off the shelves so I could read it first! Your reviews of this series always make me want to pick them up! I really need to read them! (Re:comment on my blog)--TONS of kids like Series of Unfortunate Events, all kinds. This is why I finally read one so that I could chat with them. One was all I wanted to read, but not because I felt they were not good, they have dark humor and are well written. I was very surprised I didn't take to them! Ah! I thought by the title that this was going to be a mashup book! But I love a good clean read for middle grades! Thanks for the review!